If you’re reading this, chances are you love gadgets and technology. Chances are you probably have a smartphone, and a tablet, if not, a couple of smartphones and a couple of tablets. Charging devices can be a hassle, one of of our favorite gadgets – the Sabrent 10-Port USB charger, allows you to charge 10 devices at once. However, the Fishbone Charging Station is a more organized way to give all our devices all the juice they need. The Fishbone has smart charging ports with a combined maximum output of 6.8A, which will automatically detect and adjust the power to each of our your device – charging each one optimally, whether it’s an iPhone, iPad, Android smartphone or tablet, Windows Phone or even a BlackBerry Passport. Where are the cables? You can see where Fishbone puts the cables through this gif. You would plug in the USB in the back of the Fishbone, twist the cable on the side of the compartment, and then angle your device and plug it in. Prices range from $29 (for early adopters) to $150, which includes 4 Fishbones and 20 charging cables. If you really love the project, you can pledge $10,000 to become a distributor or retailer of this product. If you’re looking for a Christmas present for one of your techie friends, this maybe the perfect present, Fishbone has an estimated deliver of December 2015. Would do you think of Fishbone? 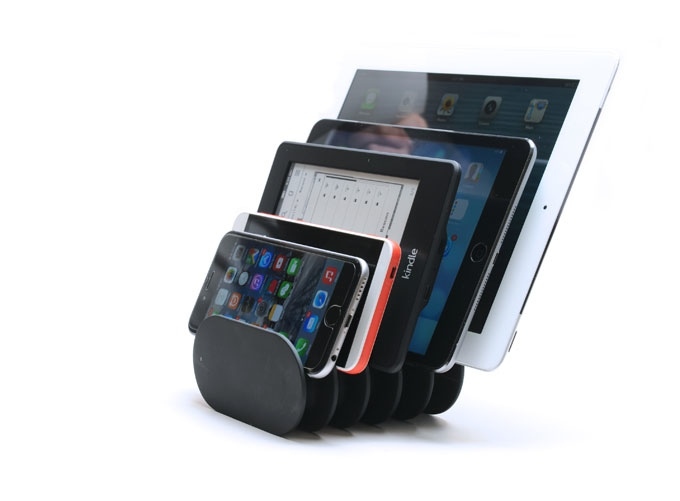 Click here to learn more about the Fishbone Charging Station.